My children LOVE imaginative play. They have such great imaginations and I never know where it will take them throughout the day! 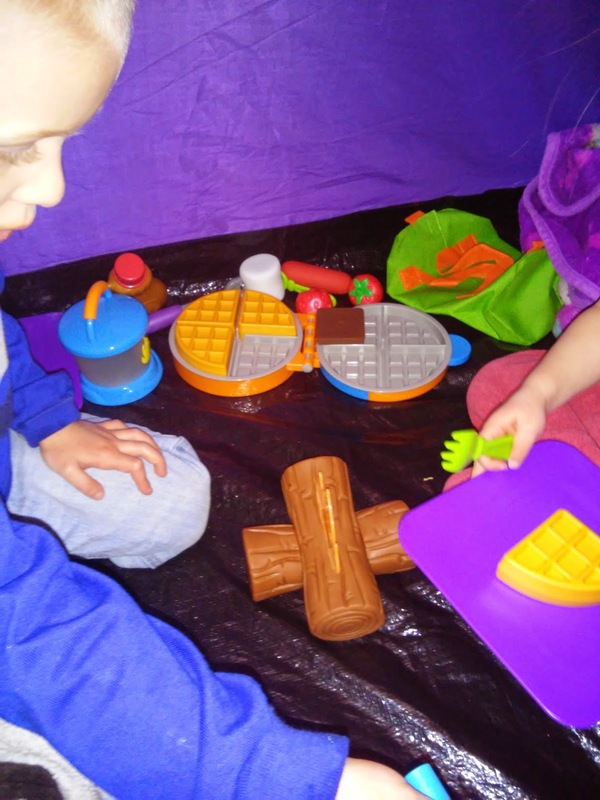 Lately, their imaginations have taken them to camping in our living room in a tent, making waffles and having a fire thanks to the New Sprouts line of imaginative play items for ages 2+! They absolutely love the NEW Waffle Time and Camp Out from Learning Resources! 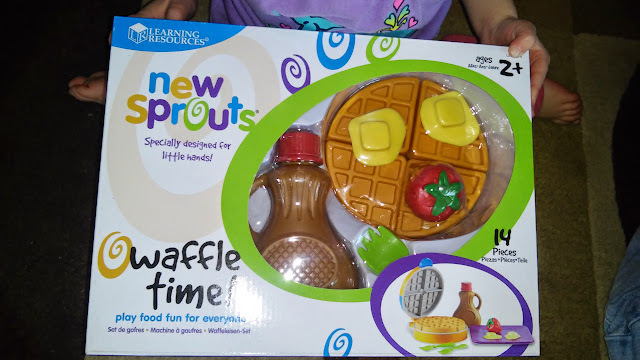 My children absolutely LOVE having real waffles for breakfast so when I gave them the opportunity to "make waffles" any time they want with their own waffle iron, their eyes lit up and they haven't stopped playing with it since I opened the box! 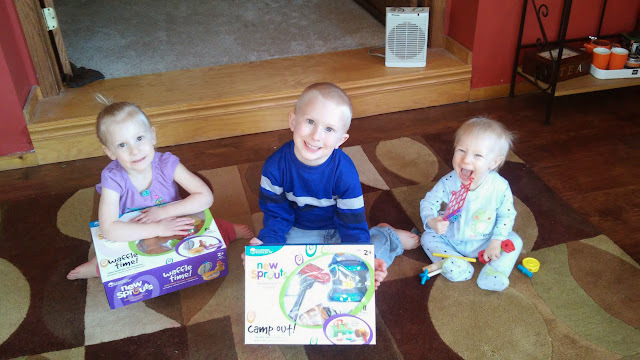 They love that they have their very own waffle maker just like Mommy and they can top their waffle with butter, strawberries and syrup! Gather around the campfire! Every day can be a campout with this adventurous set. 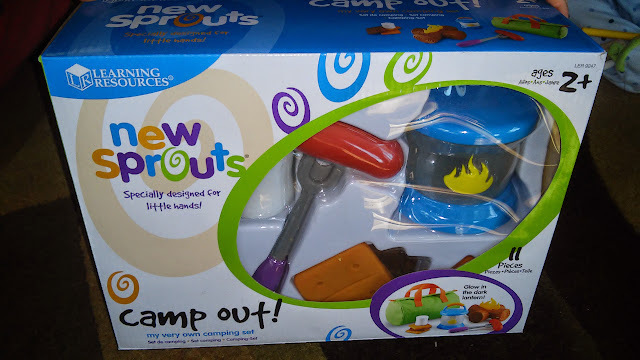 Little ones can safely build a fire, roast a hot dog and have s’mores! Both the marshmallow and the hot dog fit on the fork for roasting. The glow-in-the-dark lantern adds to the adventure, day or night. When finished, all the pieces store in the handy duffle bag. Plastic pieces are soft and durable for long-lasting fun! 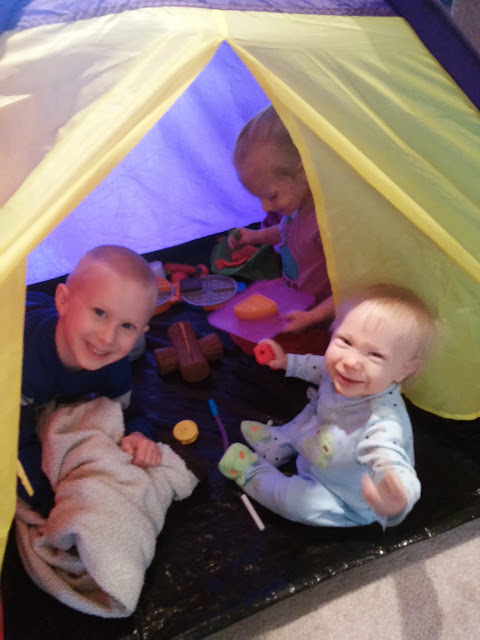 My children have several tents and love to play in them but they have now been able to bring camping up another level with the Camp Out items! I absolutely LOVED watching their imaginations take off with both these new Sprouts products from Learning Resources. They were so fun and durable and I know they will be played with for years to come! You can purchase the New Sprouts sets for $24.99 each from the Learning Resources website.